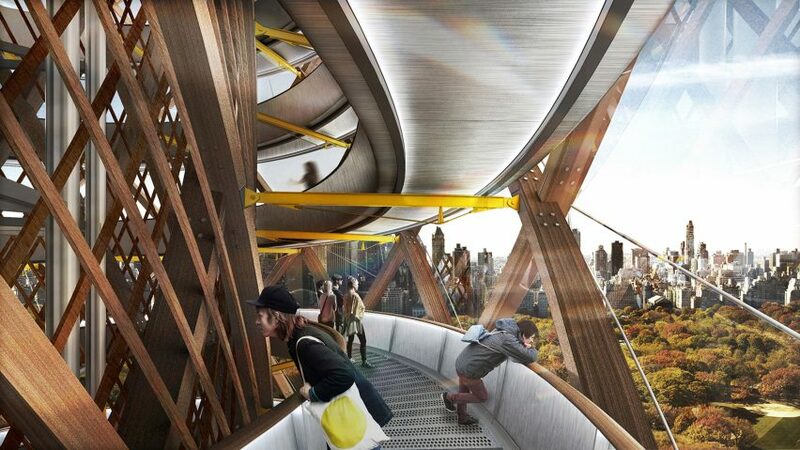 New York-based design studio DFA have created a concept for a timber-based structure that would filter a contaminated reservoir and function as a public observation tower. 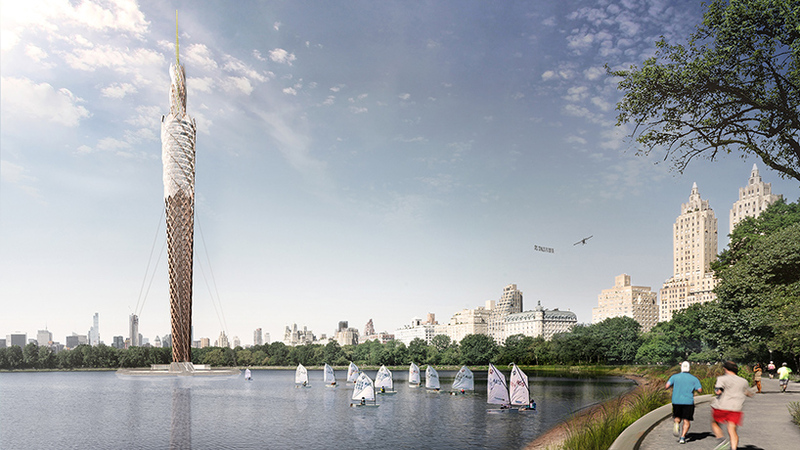 Built to be a temporary structure, DFA’s “Central Park Tower” spans 220 metres and would sit in the Jacqueline Kennedy Onassis Reservoir, a 106-acre man-made lake that encompasses one-eighth of the park’s area and contains one billion gallons of contaminated water. “Here we combine architecture, recreation, resiliency, and tourism in a project millions of New Yorkers and visitors would benefit from,” DFA studio founder Laith Sayigh explains. “Aside from supplying water to the pool and Harlem Meer, the reservoir sits stagnant and fenced off due to its current state as a health threat to millions of New Yorkers, tourists and animals. “DFA envisions a temporary landmark that is remarkably of its time to creatively transform the reservoir into one of New York’s boldest urban amenities. “By filtering and cleaning the reservoir, 106 acres of previously inaccessible park area is transformed into a place for swimming, sailing and other aquatic activities. At 220 metres high, Central Park Tower would become the world’s tallest timber structure, featuring a 56-foot-wide viewing platform and a glass oculus that showcases the tower’s functional elements. 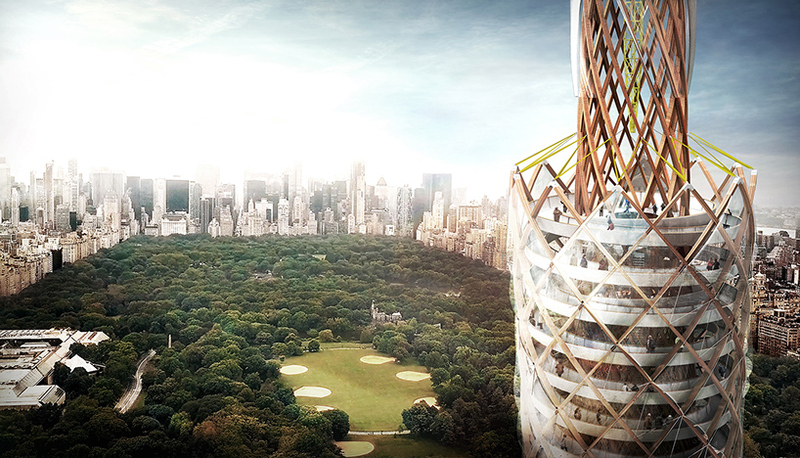 Central Park Tower was conceived as a competition submission by the studio. In order to construct the tower DFA would use a glue-laminated timber known as Glulam, which requires one-third the energy and creates less than one-tenth of the fossil fuels compared to steel manufacturing. This would allow the structure to be manufactured off-site and erected in the park in less than six months. DFA have also submitted a number of other conceptual designs to various international competitions. The studio created a detailed concept for Italy’s Castle Resort Competition in Rocamandolfi, with different types of accommodations depending on every traveler’s needs. “The visitors follow the predesigned path, experiencing each accommodation designed to host a different program, immersing themselves in the story,” the studio said. “At … Castle Siege Retreat each visitor is transformed from a tourist, into a soldier protecting and experiencing this beautiful and rich region of Italy. DFA also submitted a concept for the 2012 Olympic Pavilion in Trafalgar Square, an Olympic pavilion which incorporated interactive multimedia design, as well as basic concessions for event tickets, information, and food. The structure was designed to be fully self sustaining, and consistent with a “net-zero” energy footprint. The studio said the entire structure would have been wrapped in a rubber skin, and electricity was generated as visitors circulate over its lead zirconate titanium (PZT) surfaces.